A wonderful meal full of flavour served with rosemary baby potatoes and lemon and garlic green beans. 2. Slice two of the garlic cloves and place in a roasting tray with the potatoes, half the rosemary, half the lemon zest and all the lemon juice. Season well with salt and pepper and drizzle with 2 tablespoons of the olive oil, then roast in the oven for 30 to 35 minutes, until cooked through and nicely coloured. 3. Meanwhile, to make the lemon garlic butter, finely chop the remaining two garlic cloves and mix with the butter, the remaining lemon zest and a pinch of salt and pepper. Keep covered at room temperature until needed. 4. Drizzle the remaining 2 tablespoons of olive oil over the lollipop pork chops. Sprinkle over the remaining rosemary and rub to coat the entire surface with the oil and herbs. chops and cook the other side for a further 5 to 7 minutes, until cooked through. Remove the chops from the pan and set aside for 3 or 4 minutes to rest, loosely covered with a tent of foil. 6. Bring a large saucepan of salted water to the boil, then add the green beans. Cook for about 4 minutes, until they are just tender. Drain and toss in a bowl with the lemon garlic butter. Check the seasoning. 7. 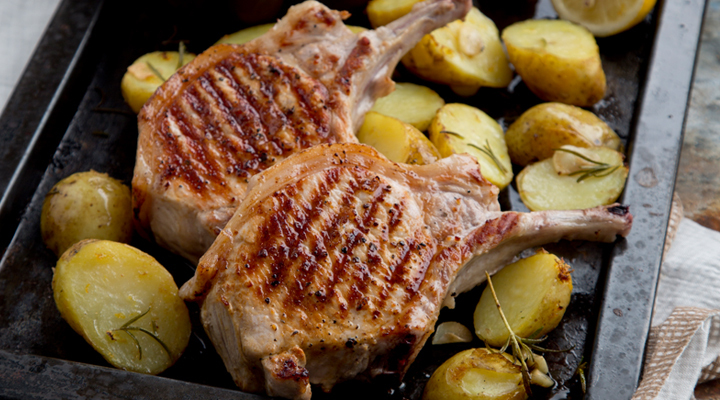 Serve the lollipop pork chops immediately with some roasted potatoes and green beans.